Imagine what it would mean for our churches, our communities, and the Kingdom if every student recognized their individual leadership style, unique gifts, and sense of purpose and confidently declared the Good News of Jesus with their lives. AND what it could mean for your students if every adult leader in your ministry were not only passionate about identifying and calling out the leadership potential in each student, but were also equipped with practical tools and leadership principles to help those students become the unique leader God has designed him or her to be! With this exact goal in mind, Doug Franklin, President of LeaderTreks has partnered with DYM to bring you a BRAND NEW DYM University course designed to help you and your adult leaders feel confident to develop student leaders in your ministry! Session 1: Why Student Leadership? In this opening session, Doug points out the biblical mandate of developing students as leaders, the important role students play in their world and challenges us to consider the difference between responsibility and leadership. In this session, Doug offers healthy starting points to developing students as leaders, including helping students identify their Leadership Type and the 5 tasks and traits of leadership. In this session, Doug walks us through the 5 Leadership Principles of Mindset and unpacks how each one can shape the way a student responds to the situations he or she is bound to encounter today and in the future. You’ll also hear practical ways to teach these leadership principles to students. In this session Doug shares the 5 Leadership Skills we can help students understand and put in to practice as they grow in their leadership. The practice of these 5 leadership skills that would be instrumental in the way they set goals, accomplish tasks, and lead others. In this session Doug will turn everything you think you know about student leadership upside down by looking at some of the downsides to Student Leadership Teams and providing a new format that fosters an environment of debrief, encouragement, and growth for busy students. Get the site license for volunteers. Everyone in your youth ministry can get access to this course for one low price! 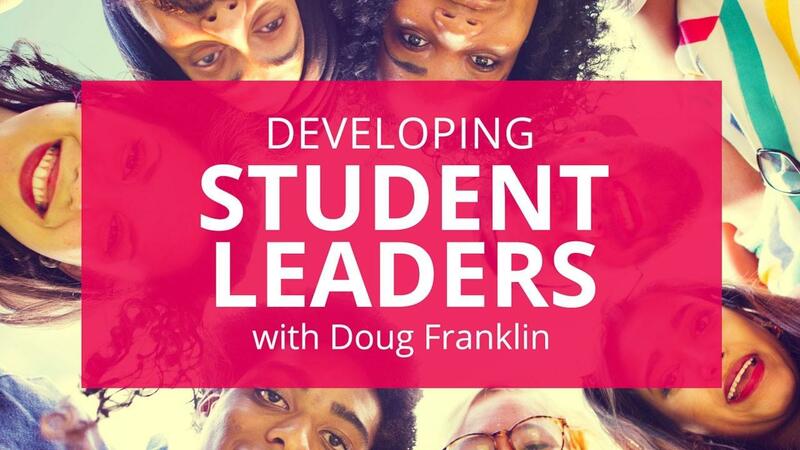 Doug Franklin, President of LeaderTreks has partnered with DYM to bring you a BRAND NEW DYM University course designed to help you and your adult leaders feel confident to develop student leaders in your ministry! This course, Developing Student Leaders, includes six 10-minute videos.